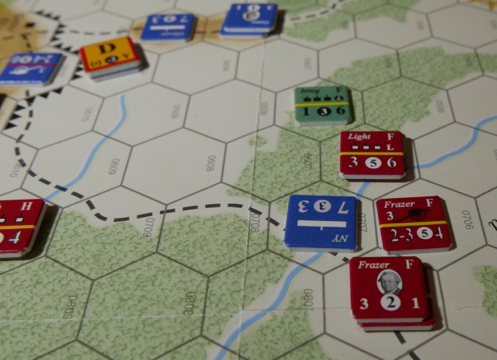 First Saratoga is a boardgame from the mini folio series by Decision Games. 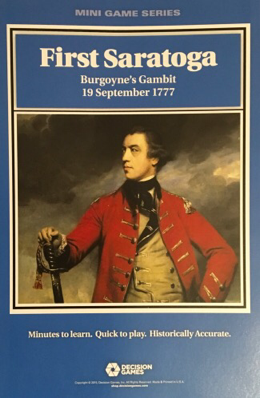 In late summer of 1777, Burgoyne's Northern Army had become isolated. The game covers Burgoyne's attempt to break through American defences at Bemis Heights to reach Albany. The system uses a quick play version of the Musket & Saber rules that are found in the larger folio games. The following is a short AAR with observational notes. I have previously found the full rules hard to hold in my head, so the quick play version is most welcome. It is a bit of a shame, but this game published in 2015 did not come with the latest series rules (4 pages) that have existed in amended e-rule form since 2013. Likewise the 2 page specific scenario sheet has not been printed to reflect some changes to the combat results - again known since 2013. The changes to the series rules are available on the DG website (Also see resource section at the foot of this article). One assumes that perhaps the series is gang printed with future release dates included. I can understand that for expensive parts such as counters and maps, but the simple rules should be available in an up to date format with the game. The game has a small footprint with a map of 11" x 17" and just 40 game counters. The map looks nice and has large hexes (small counters) but the difference between heavy and light woods terrain types is not immediately apparent, though these areas do not really get played on. You can see them once you have scanned the map for them in good light and some Q&A identifies an additional heavy wooded two hex ravine. The system has mostly been used for Napoleonic and ACW battles, so to come to AWI the specific rules include a 'Battalions' rule to reflect the smaller formations deployed here, together with the nuances of skirmishing and rifles. The resource section (below) has a link to a blog AAR that highlights the full system. The American forces are largely behind earthworks on Bemis Heights, with some capacity to put units further forward, which I used to block the British advance. The British start off map in three columns, arriving on three different trails. 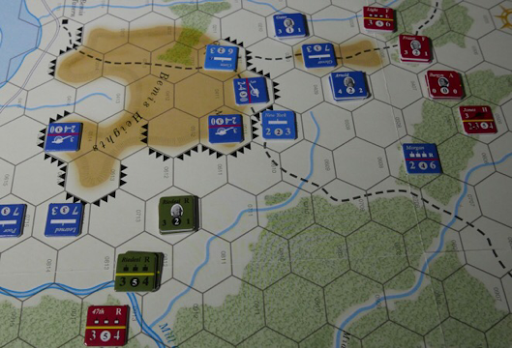 The game starts with fog, which significantly slows the British movement. As the game progresses, there are differing chances (including 100%) for the fog to lift. It can return on turns 6 and 7. The British will be aware that they are up against the clock as there are 7 turns. In our game, they get lucky and the fog lifts on turn 2. The left and right British columns are almost certainly always going to use the roads to get them onto the enemy flanks. The early decision for the British player is where to send the centre column. It can advance through the centre, which is lightly wooded and looks like an obstacle, but in practice is not. Or it can move over to either flank to support one of the two other columns. I chose to push through in the centre. By turn 3, the British had reached the first American positions. On the left Riedesel attacked successfully, having outflanked the earthworks, but a counter-attack, supported by artillery on Bemis Heights pushed them back over the stream. While the Colonial forces include a couple of battalion formations, all the British forces are battalion strength and they are single step units, so are fragile. Also, if battalions retreat, they are flipped to their ineffective side (like artillery and leaders), which basically gives them much reduced operating values and they will take at least a turn to recover. By contrast, the Colonials have several regimental sized units (strength 7) and a couple of militia regiments, which are double steppers and so more resilient. On the right, the British were just getting into position to assault. Combat is not mandatory, but if a player doesn't attack a valid unit (ZOC related), then that unit can counter-attack at the end of that Combat Phase at double strength against any unit, even moving 1 hex to reach an attack position and that can be quite punishing. Note in the photo (right), the unit with a yellow counter is a Colonial battalion that has just routed from this situation, leaving the New York Regiment exposed to envelopment if it does not retreat. The attack on the left wing had ground to a halt, but over on the right the British were pressing on the high ground (a victory location) east of Bemis Heights. Within a couple of turns, they had routed the defenders and taken the hill. 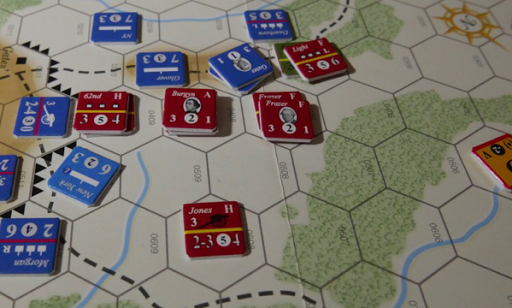 Colonial units started to move across to this flank, but it took time, especially as the militia units (pale blue) have to pass a morale test to go adjacent to an enemy. The one in the photograph failed its morale test twice before taking its place in the line. At this point, British casualties were higher than the colonials, but holding this high ground would give them the game if they hang onto it. In the last two turns of the game, the colonials were successful in pushing the British off the high ground. The British took heavy casualties and the retreats forced their battalions to flip over to their ineffective side. 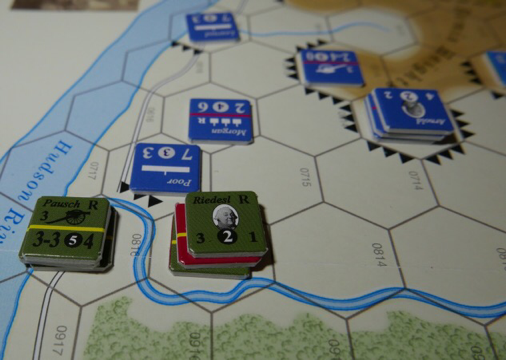 In the final turn, the fog returned, curtailing Riedesel's attempts to push through the Colonial centre onto Bemis Heights, not that there was enough time for them to reach the two hexes up there that would give the British a sudden death victory (one being Gates HQ). As time was called, it went to casualties. The British had lost 7 units, the Colonials just 3, making them clear winners. I really like the idea of the small format game combined with enough system to make the play interesting and the nuances that crop up are very engaging. However, the rules still feel awkward at times. It was not helped that I had to download the latest rules, which are formatted into an 11 page text, this is against the convenience of the 4 page official rule folder, which actually holds the same volume of text, so those 11 pages are really the same as 4. It would be easier if the game had included an updated CRT results, as this more than anything else is what I had to keep diving into my downloaded rules for. Despite the this, I like the small footprint and of what the rules set out to achieve, so I have ordered the sister game 'Germantown'. The inclusion of battalions, skirmishes and rifles does help bring Saratoga a period feel. Solitaire value - This is a two player game that plays fine solitaire. Time - The rules read quickly, but the first game will be spent with quite a lot of rule referencing. A second game will go more more smoothly and my games have been taking around an hour to complete. Size - It doesn't come much smaller than this, making it suitable for many domestic situations and ideal to take away as a vacation game. My downloaded sheets, home made cheat sheet and the official rules became a bit messy to manage. If they could only get their included rules updated to avoid the downloads, then this would be perfect. Complexity - The quick play version is rated as low (1 out of 5), which I feel is an underestimation of what the player faces. Despite being the quick play set, that is a relative term compared to the clunky full rules and this shortened version still has quite a lot of system (the rules plus scenario information comprise 6 pages in a 3 column format and are without illustrations). You get an engaging game, but there is quite a bit trucked away in one liners and there is ambiguity that still needs to be written out. This creates a learning curve that can be conquered after an initial play or two, but if you put the game away for any length of time, there is a re-learning curve on some of of the points (writing out some game notes for future use helps here). There are quite a few games in the series now, so it may be the case that a typical player will become increasingly familiar with the rules due to repeated play potential. I would rate the game as complexity as closer to 2 (out of 5). I find myself pleased with the system and wanting some more and I am glad that Decision Games put out a Quick Play set, but this is tainted by some frustration that there is still more rule referencing than I care for. It should also be mentioned that these games can be had for around £10 or less and at that price, gamers may well feel it worth getting just to see whether the system suits them. I've not considered a DG offering for many years. My experience has been that game design is often underdeveloped and components are not state of the art. Still, I pick up the occasional S&T. Perhaps I should reconsider? Appreciate your review! I used to buy a lot of DG out and now I don't for the reasons you highlight. I got a couple Decision Games in the past but the sloppy implementation put me off. I really like what they're trying to do in this space and think there is ample market of cost- and/or space-conscious consumers who would really benefit from these folio-style games. Unfortunately DG's slipshod implementations really ruin the experience and make it too frustrating. A little more attention to detail would go a long way but that seems to be beyond their capabilities, sadly. I like this format as well. A real commander should not have to control more than about 8-12 formations. This game pretty much hits the right command level. The rules are simple but like most board wargames these days, there does seem to be at least some fiddliness which can be hard to remember. I'm not really put off by the counter/map art or anything like that. I think it is a solid offering. I had no idea there was a rules errata. You are right. They should have updated the physical game! Really happy to see you back! I was thinking of what could be done to the trolls among us. My current scheme would be to send a message on their behalf to certain websites, expressing great interest in meeting their selections of young, beautiful Russian/Hungarian/Filipino/etc. brides who are seeking generous American gentlemen. The resulting spam in the trolls' mailboxes should keep them too busy to slam anybody. Thanks all, I enjoyed getting back into the saddle and dabbled with a slightly differerent format (start - mid - end game points and mixing observations into the game notes). Chris, my approach to my browsing time now is to just visit those places that are of a positive and creative nature. On blogs alone, there is so much blog stuff around now that you can easily select the ones that match your interests and create yourself a virtual bespoke magazine experience - how good is that! Hi Norm, welcome back! Your blog was sadly missed. Thanks for the review of Saratoga, very helpful.I have Saalfeld which is also a very nice little game. Hi Jay - liked the look of your recent 'aquisitions'. I did a Saalfeld blog post and enjoyed the scenario as it has more cavalry than usual in these games, it just adds a different perspective. 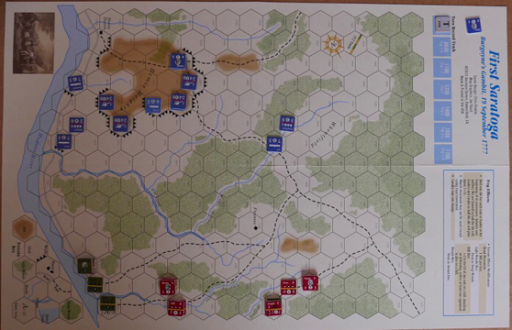 The series has a lot of potential and of course are small enough to have at least part of the action transferred across to figure and hex games, something that I intend to explore as these 1/2 inch counters can simply be put behind the units and would be no more obtrusive than the commonly sed dice markers are.